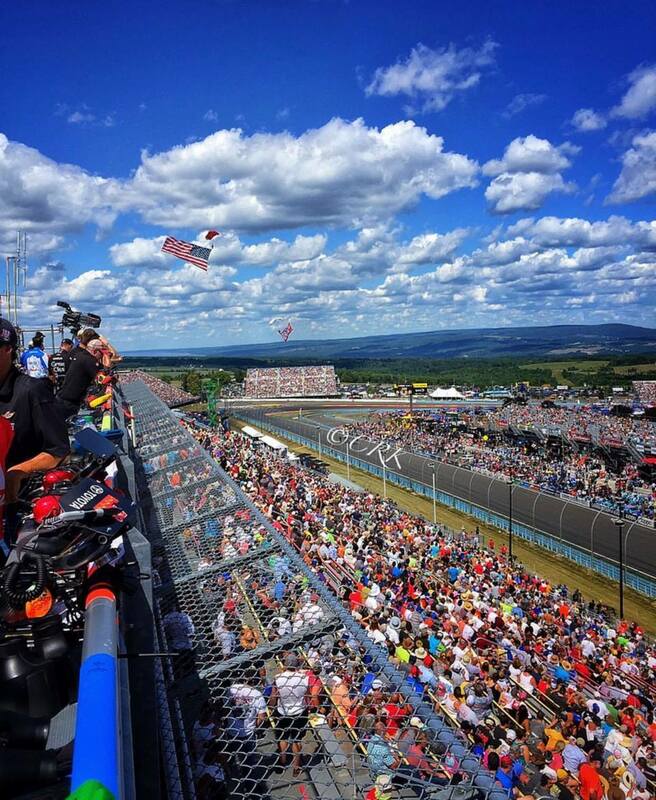 The Team Fastrax™ professional skydiving team has performed at many NASCAR, IndyCar and Formula One race locations. The team has been seen at Talladega Superspeedway, Indianapolis Motor Speedway, Charlotte Motor Speedway, and Grand Prix of St. Petersburg. In addition, other performances include Chicagoland Speedway, Pocono Raceway, Homestead-Miami Speedway, Watkins Glen International and numerous others. The team will sometimes fly in the Speedway flags, or Ford, Toyota and Chevrolet flags. If you are planning a NASCAR, IndyCar or Formula One event, Team Fastrax™ has a demonstration skydive to match your needs. 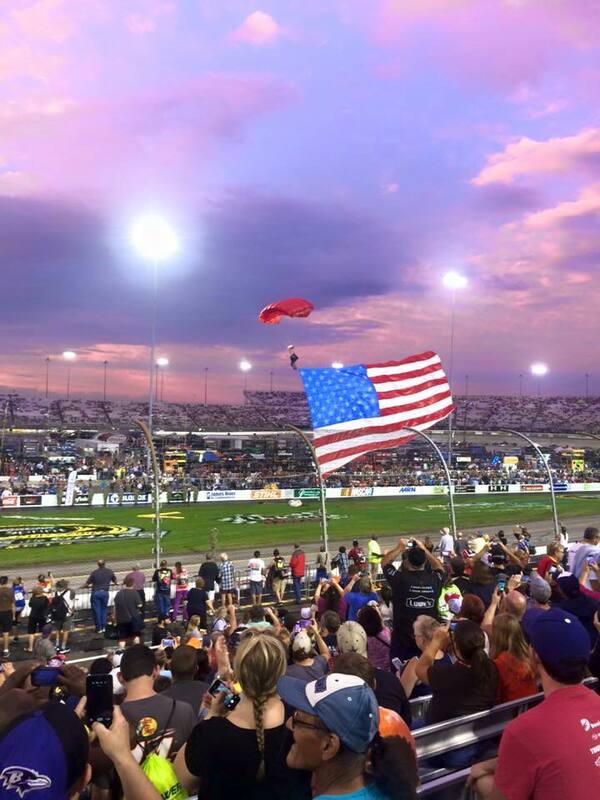 NASCAR races typically feature our most patriotic show, an American flag demonstration skydive. Our parachute team will exit the aircraft over the raceway and descend to a precise landing, thrilling the spectators. This makes for an amazing opening ceremony show. 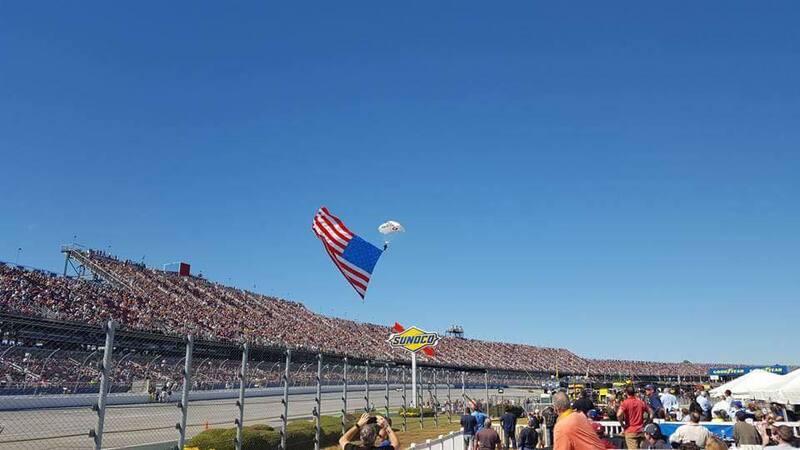 Team Fastrax™ owns and routinely performs with the Largest American Flag ever flown under a parachute. Measuring at over 7,800 square feet, our largest American Flag can be seen for more than 35 miles when flown. We have the industry's largest inventory of more than fifteen American flags. The flags range in sizes from 250, 500, 1100, 1800, 2000, 2500, 5000 and 7800 square feet. No team in the world has big flag jumping experience like Team Fastrax™. We have flown with precision as many as ten flags at once. In addition to our American flags we also have a ready collection of several large flags. These include a Purple Heart, Honor and Remember Gold Star Flag, Thin Blue Line honoring our Law Enforcement, and POW/MIA. We can also make CUSTOM banners to jump at your show with the logo of your sponsors. Contact us today for a price quote. The Night Pyrotechnic Skydive is our most popular show. It consists of several highly trained and specially licensed Team Fastrax™ demonstrators exiting the aircraft 6,000 feet above the earth. Brilliant white or multi-colored projectile pyrotechnics are then ignited and flown in formation. This creates a dazzling display for spectators on the ground. We also have shows where we launch up to 33 one inch projectiles, putting on a spectacular display. The pyrotechnics are ignited continuously for the duration of the 5 minute show. They then extinguish right before the jumpers safely land in the target area. Even more breathtaking is when Team Fastrax™ performs our High-Altitude Freefall Pyrotechnic Starburst Show! Resembling a falling meteorite, four or more highly trained and specially licensed Senior Team Fastrax™ demonstrators will jump from the aircraft at 13,000 feet. They ignite their pyrotechnics immediately after exit. Spectators will see a flaming fireball leaving a 1,000-foot trail. The jumpers freefall for 20 seconds at more than 120 miles per hour before splitting apart in a starburst formation. Once under canopy, the demonstrators will ignite even more pyrotechnics continuously. This show normally lasts 10 minutes. 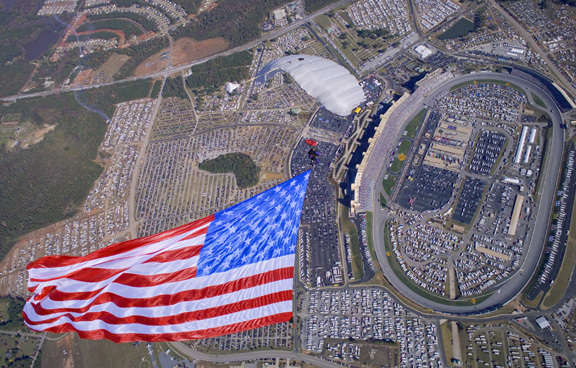 NASCAR and Formula One event planners can contact us today to schedule an amazing demonstration skydive.